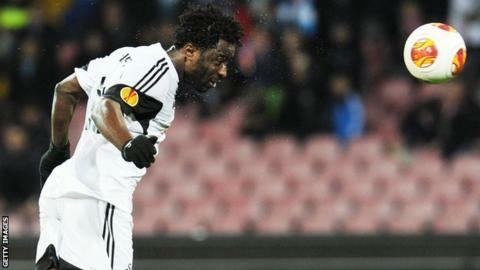 Ivory Coast striker Wilfried Bony is a vital part of Swansea's future, says manager Garry Monk. Bony, who joined the Premier League side in July last year from Vitesse Arnhem for a club record fee of £12m, has scored 20 goals for the Welsh club in all competitions this season. "We want to build a team around him," Monk said of the 25-year-old. "Wilf is a Swansea player and we want him here. He is an important player for us. We want him as part of our future." Bony has been in excellent form in the last half of the season, rising to the extra burden placed on him as a result of a long-term injury to fellow striker Michu. In the 17 matches that the Spaniard has been out of action, Bony has hit 10 goals. His performances have endeared him to the fans, something that has not gone unnoticed by Monk. "I think he has got a good relationship with our crowd now, too. They have warmed to him, and he is really enjoying his time with us," Monk said. And his displays will almost certainly ensure he secures a place in Ivory Coast's squad for this summer's World Cup in Brazil. Monk is keen for his striker to experience the world's biggest football event and believes it will benefit both the player and Swansea. "I hope Wilf goes out there, does really well and then comes back here full of confidence," he said. Ivory Coast will kick off their World Cup campaign against Japan on 14 June, with Colombia and Greece their other opponents in Group C.